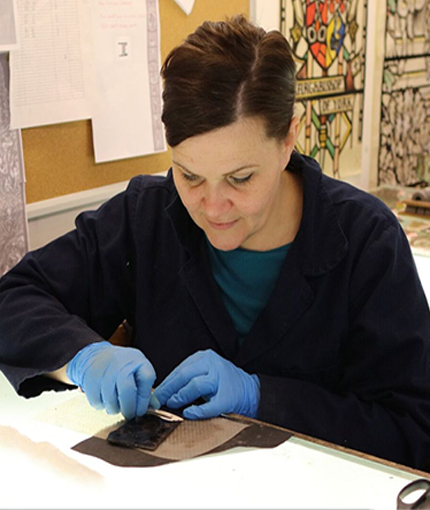 The company has 16 employees, with a wide spread of experience from apprentices to mid-career conservators, and several staff members with 30 plus years experience. 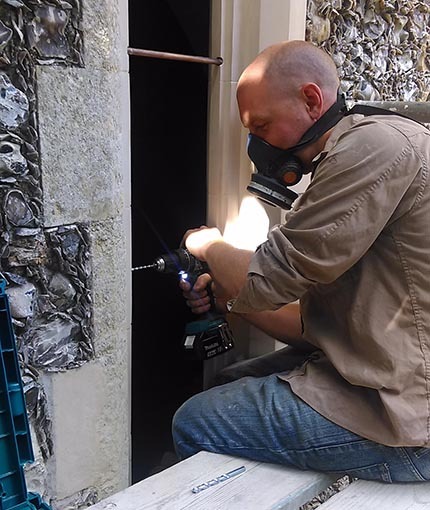 Three of our staff members are SPAB Fellows, and two are fully trained stonemasons, bringing to the team an awareness of other conservation disciplines and philosophies. BA Hons. 3-Dimensional Design: Glass, University of Wolverhampton, 1991 – 1993. S.P.A.B. Fellow, 2001. 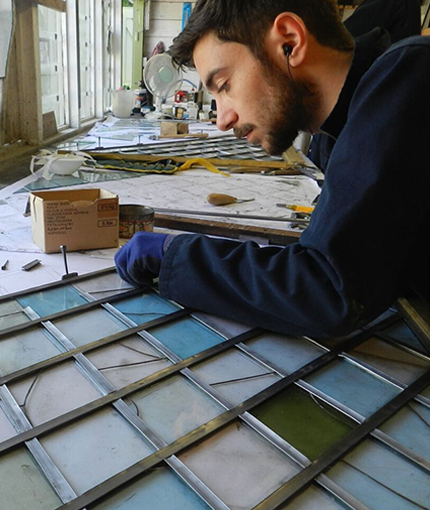 MA in Stained Glass Conservation and Heritage Management, University of York, 2008 – 2010. 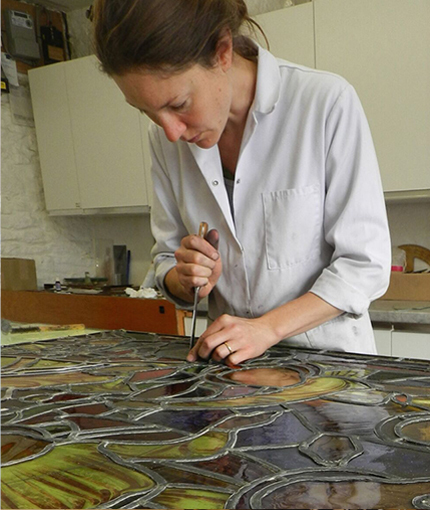 Helen has over 20 years practical experience as a stained glass conservator, painter, and glazier, including working at the Victoria and Albert Museum, London. After 12 years at The York Glaziers Trust, York, she took up her current post at Holy Well Glass in 2016. BA Hons. Sculpture, Manchester Metropolitan University, 1996 – 1999. NVQ Level 3 Stained glass 2005. Pro-skills advanced “apprenticeship of the year” - highly commended, 2007. Travelling Craft Scholarship to conservation workshops in Germany and Belgium, 2004. Steven’s design competition – commendation, 2003. Helen was employed at Holy Well Glass in 2003. BA Hons. English Literature and Spanish, Bath Spa University, 2010 - 2013. Post Graduate Diploma in Journalism, Cardiff University, 2013-2014. Jack has long term involvement in the family business, and is immersed in developing strategies to take the business into the future. He is currently registered on the ICON pathway to become an Accredited Conservator Restorer (ACR). Throughout 2017 Jack is undertaking the S.P.A.B. Fellowship programme. ICON accredited conservator. Fellow of the British Society of Master Glass Painters, Liveryman of the Glaziers Company. National Stained Glass Advisor to the National Trust. External assessor for ICON Professional Accreditation of Conservator Restorers. External assessor for AABC, the register of Accredited Architects in Building Conservation. Steve commenced training at Fulham Glass House under Carl Edwards in 1980. He spent a further 10 years at Chapel Studios, mentored by Alf Fisher, before setting-up HWG in 1995. BA Architectural Stained Glass, Swansea Metropolitan University, 2008 - 2011. Gemma was awarded The George and Evelyn Gee Prize for Craftsmanship in 2016, from the Worshipful Company of Glaziers, as part of their annual Steven’s Competition. 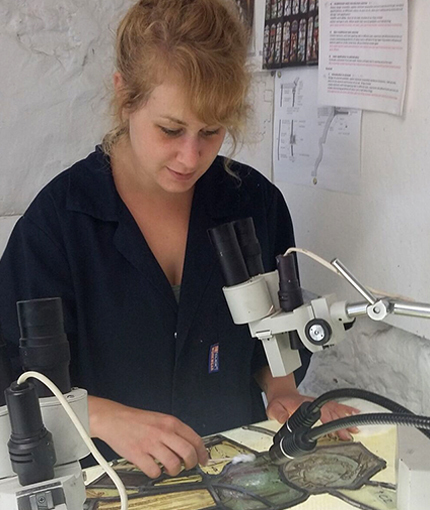 Gemma was employed as a trainee conservator at Holy Well Glass in 2013. 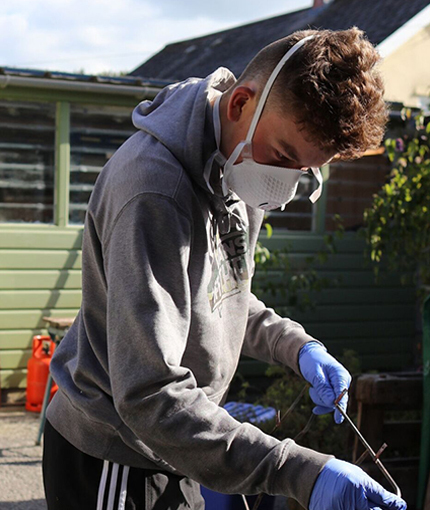 Connor ably assists in the workshop 2 days a week whilst studying for a Level 2 Diploma in Carpentry and Joinery, at Weston College, Somerset. He started at Holy Well Glass in June 2014. After 9 years working in the service industry up to management level Chris decided upon a change of direction and started at Holy Well Glass in 2016. HND Architectural Stained Glass, Swansea Institute of Higher Education, 2015 – 2017. 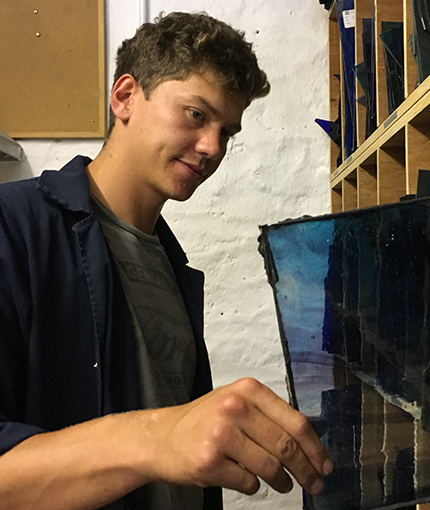 Previous to his studies Dan spent over 5 years gaining practical skills in a variety of glazing and stained glass workshops. He was employed at Holy Well Glass in 2017. ICON accredited conservator. BA Hons. Architectural Stained Glass, Swansea Metropolitan University, 2005 – 2008. Chemistry for Conservators Course, International Academics Projects, 2016. Awarded the 2016 “New glass artist of the year” accolade by the Worshipful Company of Glaziers. Winner of the 2016 Steven’s Competition and Prize for Presentation. 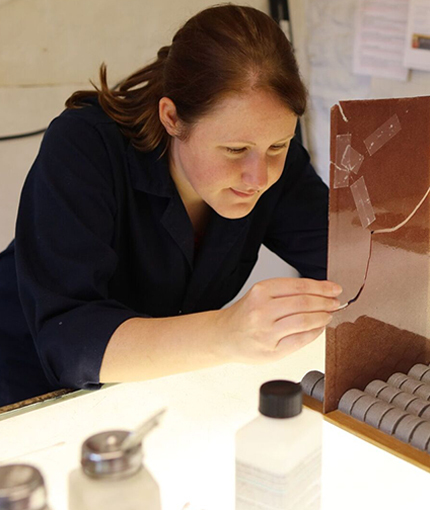 Sarah began as a trainee conservator at Holy Well Glass in 2008. HND Architectural Stained Glass, Swansea Institute of Higher Education, 1990 – 1993. 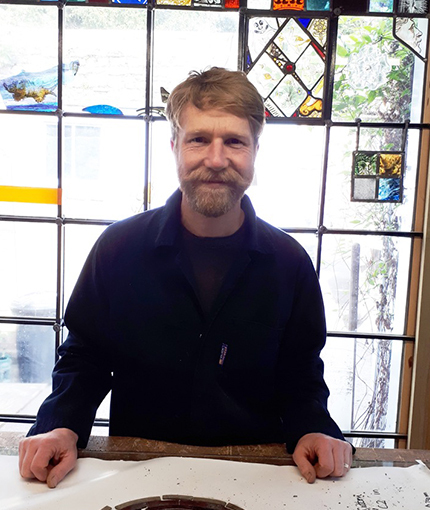 Stuart is a freelance stained glass artist, whose private commissions are generally focused on work in the public realm. Alongside this he works for Holy Well Glass on a part-time basis, bringing his finely honed practical skills to the workplace. He is a member of the Devon Guild of Craftsmen. BA Spanish Languages and Economics, University of Maryland, College Park, 1988 – 1992. 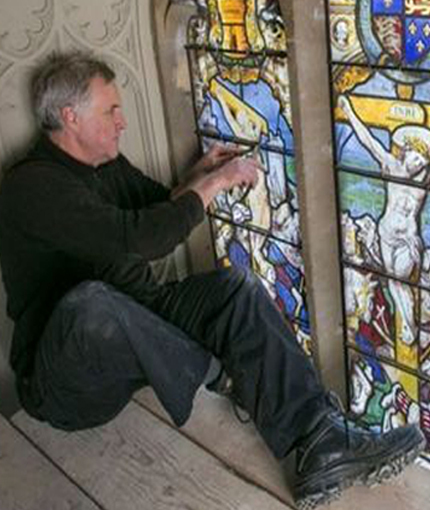 MA in Stained Glass Conservation and Heritage Management, University of York, 2010 – 2012. 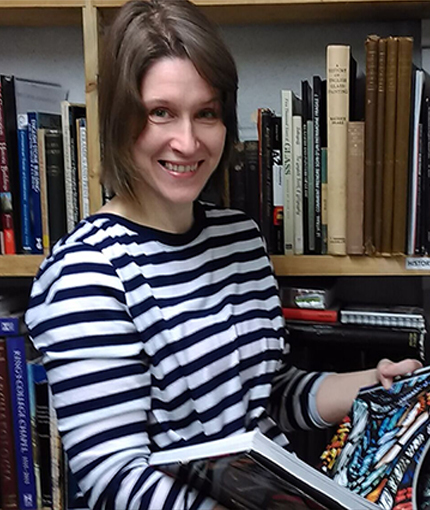 After her studies Clare has been working freelance in the United States, before joining the team at Holy Well Glass in 2017. NVQ3 Stonemasonry, Moulton College and Bath College, 2007 -2010. NVQ 3 Heritage skills, York Minster Cathedral Stoneyard, 2013. SPAB Fellow 2012. MA in Archaeology of Buildings, University of York 2013 - 2014. 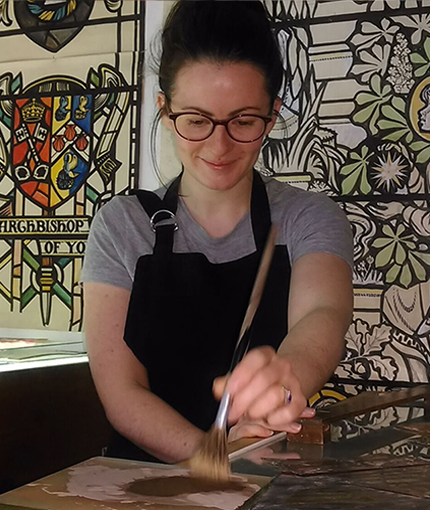 As well as Sam’s considerable stonemasonry skills she now seeks to build up new skills in the allied trade of stained glass. She began her training at Holy Well Glass in 2016. NVQ 3 Craft Masonry/Heritage skills, 2012. Jon spent 10 years working for Wells Cathedral Stonemasons, recently working on a range of prestigious Oxford Colleges; gaining valuable site experience in stone conservation and restoration, during which he rose from the position of labourer to site supervisor. In addition to Jon’s considerable stonemasonry skills he now seeks to build up new skills in the allied trade of stained glass. He began his training at Holy Well Glass in 2017. BA Hons. 3 - Dimensional Design: Idea Material Object, Bath Spa University, 2010 - 2013. Shane started work at Holy Well Glass in 2013. 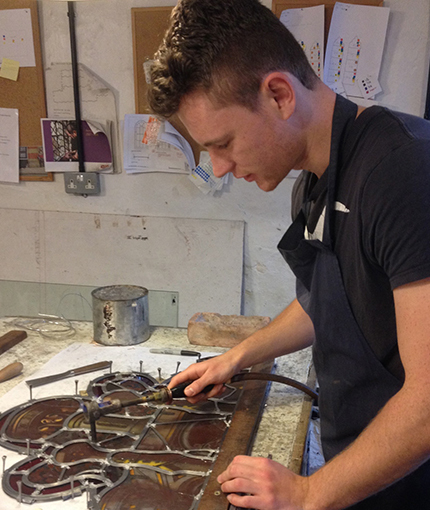 In 2017 he completed his 3 year Apprenticeship in Stained Glass Practice, organised through the Worshipful Company of Glaziers.